Christina Schroeder received her MSc in Chemistry from University of Kalmar, Sweden in 1998. As part of her masters, she joined Prof Richard Lewis for a 6-month internship at the Centre for Drug, Design and Development, The University of Queensland, working on conotoxins inhibiting calcium channels. After her masters, she worked as a Research Assistant at the Karolinska hospital and Stockholm University in Sweden until she returned to Australia in 1999 to conduct her PhD at the Institute for Molecular Bioscience (IMB), The University of Queensland under supervision of Professor Richard Lewis and Professor David Craik working on the development of an omega-conotoxin pharmacophore. 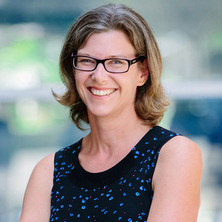 After completing her PhD in 2003, she carried out a postdoc in Professor Lewis' laboratory until 2006, when she joined Professor Philip Dawson’s laboratory at The Scripps Research Institute, La Jolla, USA to work on developing palmitoylated peptides as chaperones for infantile Batten disease. In 2007, she moved back to Australia, to join Professor Philip Hogg’s laboratory at the University of New South Wales in Sydney where she worked on the multimerisation of large proteins via disulfide bonds. In 2011 she was recruite back to IMB to join Professor David Craik’s group. Dr Schroeder's research is focussed on using bioactive peptides in drug design and to understand the mode of action of toxins binding to sodium channels and their surrounding membranes with the ultimate goal to develop novel non-addictive pain therapeutics. Dr Schroeder's research focuses on bioactive molecules isolated from plants and the venom of snakes, spiders and cone snails and she actively pursue these molecules in a quest for identifying new drug leads for the treatment of chronic pain, inflammation, obesity and cancer. Specifically, she is interested in understanding how to harness the natural drug-like properties of these bioactive molecules and use them as neuroscience tools to explore the interactions between the bioactive molecules and their targets in the human body. She investigate these interactions using sophisticated peptide engineering, a range biophysical techniques including NMR spectroscopy and activity assays. By understanding these interactions in detail she believes we will be able to create new and improved drugs with fewer side effects. During the past 12 months, her research has discovered that certain spider toxins, interesting as drug leads for the development of treatment of chronic pain, not only interact with a particular target receptor in humans, but also interact strongly with the surrounding lipid membrane. This discovery will alter the way we rationally design novel sodium channel inhibitors in the future and has lead to a collaboration with a major pharmaceutical company.